MyMovingReviews.com is one of the biggest and most trusted moving related websites. MyMovingReviews is dedicated to help people move smoother, faster and easier by offering an easy to use platform for anyone that wants to share their experience with their moving or auto transport company online and spread the word out. The website continue to develop additional tools to ease the relocation process – moving estimators, resources, moving tips, guides and even smartphone apps. 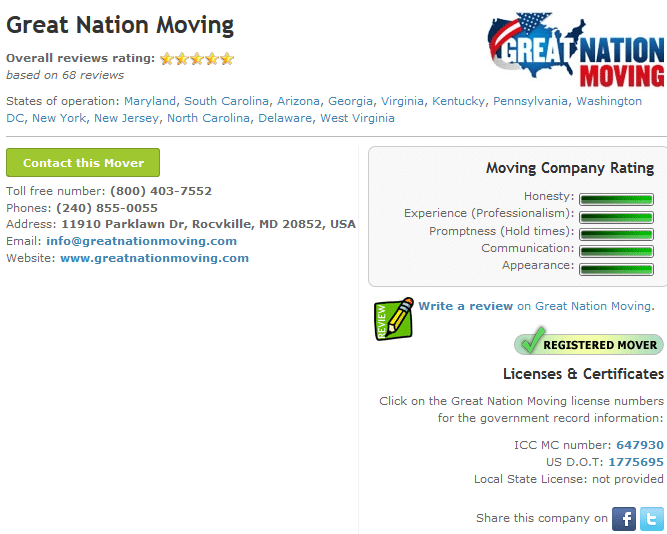 We are proud of our ‘Recommended moving company ‘ sponsored badge for the Maryland, Virginia and DC state pages and a perfect 5-star rating, currently based on 68 reviews.